If you're going to open a new business, you might as well have a superb product as your flagship. Pillar Pet Products, Inc. has a pretty spiffy start with its first product, the Perfect Petfeeder. For a $499 introductory price tag, it better live up to its name. 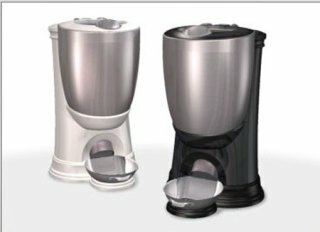 The modern design in stainless steel makes the Perfect Petfeeder look as solid and upscale as any Cuisinart I've seen. It weighs 19 pounds empty, so it is a substantial product. But what does the Perfect Petfeeder do that a plain old pet bowl won't do? 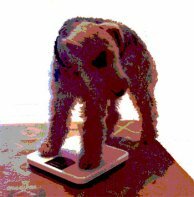 Portion control is an important feature of the Perfect Petfeeder, as weight reduction or weight maintenance may be desirable for the pet owner. You can program the amount of food for each feeding; the container holds up to 10 pounds of food, so you could program the Perfect Petfeeder for to several days. Although the Perfect Petfeeder operates on electricity, it comes with a two-year battery pack for back-up should there be a power outage. When you order a second battery, the company sends you a pre-paid envelop to return the old battery; therefore, you don't have to worry about disposal. No measuring required – the unit can be programmed to dispense up to six meals a day and each can be a unique amount from as little as a few pieces up to several cups. Works with any shape or size dry pet food and is designed to feed cats or small to medium size dogs. Power outage protection – battery backup system remains fully charged and a will continue to operate for days in the event of a power outage. Easily feeds one or two pets, and both single and double bowl components are included. Low food alert - Integrated sensor alerts the pet owner when the unit needs to be refilled. 3 year, no cost, replacement warranty and 35 day satisfaction guarantee. Stainless steel components are hypoallergenic and dishwasher safe. Paw proof design ensures that pets can not reach or dislodge food. The Perfect Petfeeder has a unique design and function. Both its 35 day return policy and the 3-year warranty are generous, longer than most costly kitchen appliances. 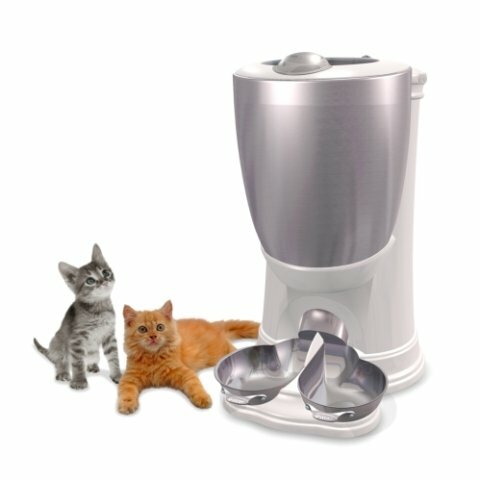 If you and your pet's needs can be served by a feeder with the above features, I would definitely look into PerfectPetfeeder.com. also see: What's $1000 For YOUR Pet's Bowl?